Decontamination and demolition (D&D) activities are a specialty of North Wind. North Wind performs over $35 million annually in construction and D&D activities. Large-scale abatement, decommissioning and demolition have become core competencies of North Wind. We have performed over 75 large-scale facility abatements and demolitions across the country at government sites over the past 5 years. 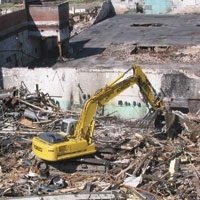 We have developed the capabilities to plan and execute large-scale demolitions of complex and contaminated facilities in a safe and compliant manner. Additionally, North Wind performs radiological decontamination and/or stabilization in support of demolition or free-release. Within the past 5 years, North Wind has decontaminated over 250,000 square feet of floor space and over 1 million square feet of overhead space (e.g., walls, structural steel, ceilings, etc.). We have performed selective decontamination or application of fixative to radiological contamination in 18 facilities to support open-air demolition. North Wind maintains a Radioactive Materials License (#201-785-90), issued from the State of Kentucky (a Nuclear Regulatory Commission (NRC) Agreement State, that allows us to take possession of radioactive materials in the performance of decontamination, demolition, reclamation and/or site restoration activities – allowing us to provide our clients with turn-key radiological D&D services.